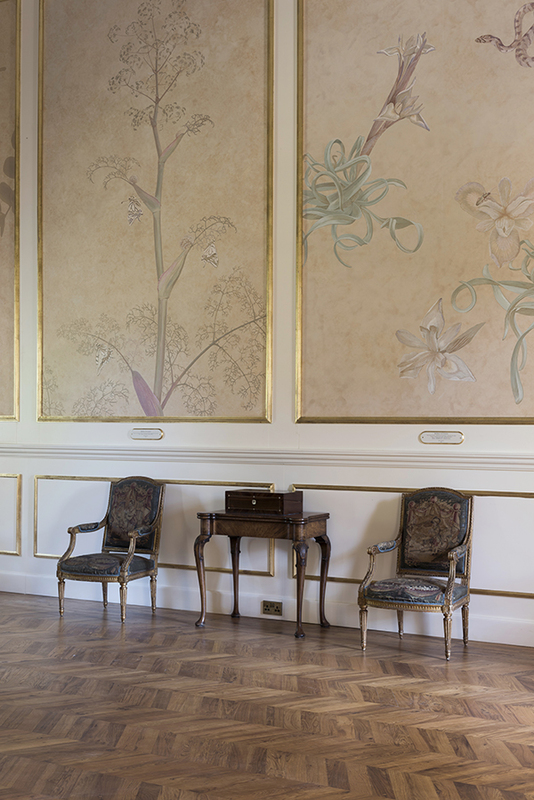 When a wing of Malta’s 17th century presidential residence underwent extensive redecoration, Dutch artist Peter Korver was commissioned to create a series of botanical paintings for the palace’s Grand Salon. 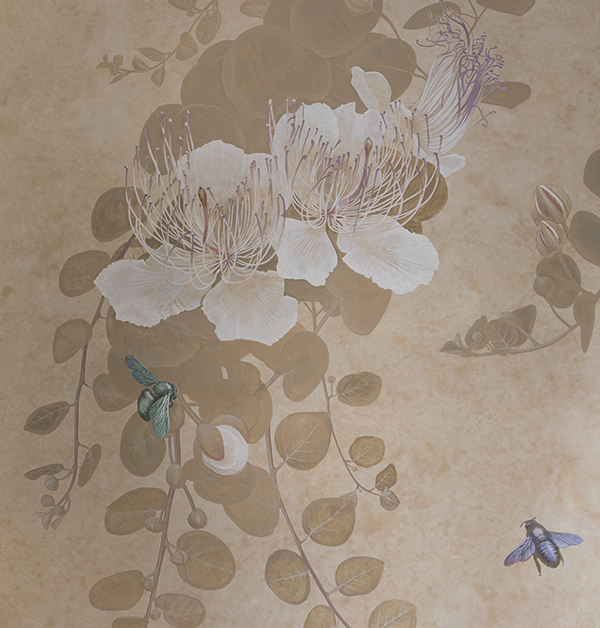 Now installed, Korver’s ceiling fresco and monumental wall panels beckon you to meet some remarkable animals and plants deeply rooted in the soil of these islands, almost literally so, as the paint used as background was made using the dust of pulverized Maltese limestone. I have it.” wrote early romantic poet Samuel Coleridge to a friend in 1804, while staying in Malta for several years in the entourage of the first British Governor. 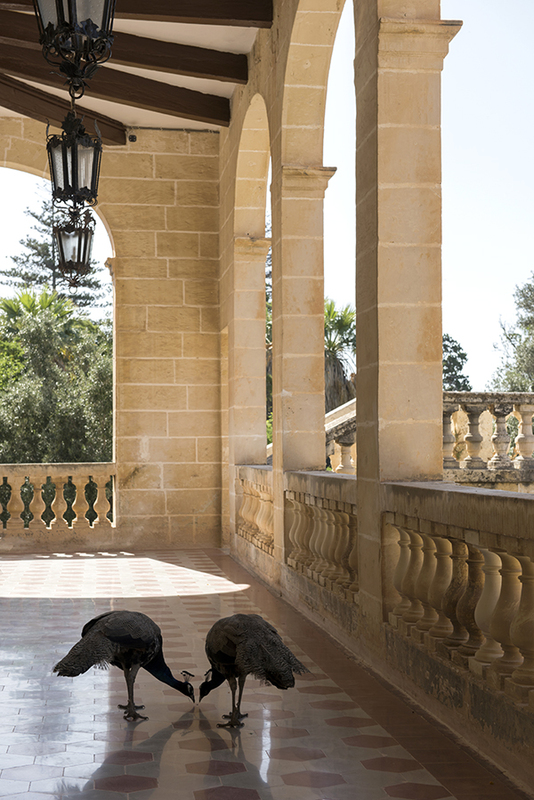 Unfortunately, in later years, some of Malta’s heads of state did not always share Coleridge’s aesthetic appreciation, and thus, over time, an entire wing of the Palace was stripped off the grandeur which had enraptured the English poet and was turned into series of bleak offices. 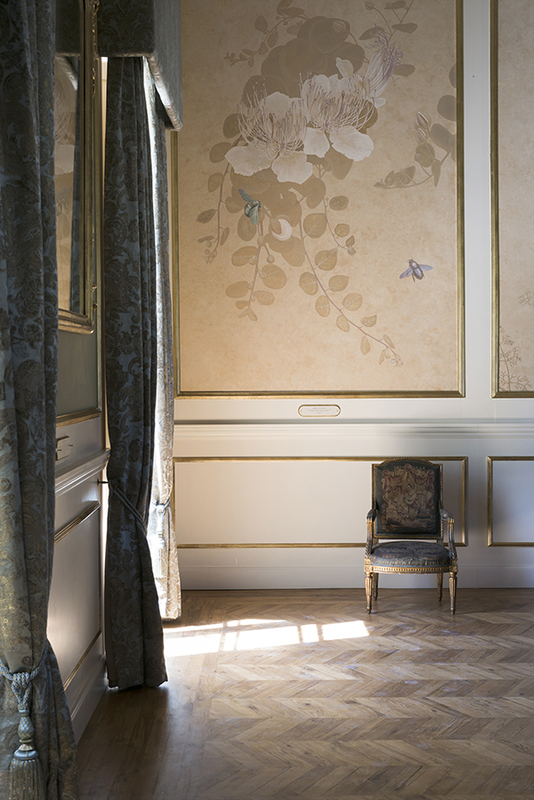 “But that was to change when current President Coleiro Preca took office in 2014, making it one of her missions to bring back the splendour that would once have distinguished these rooms,” explains Dutch artist Peter Korver, who became an integral part of the restoration. 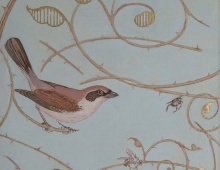 Known for his ceilings, panels and murals of intricately painted plants and animals, Korver’s artwork adorns Amsterdam’s canal houses and Dutch period estates. 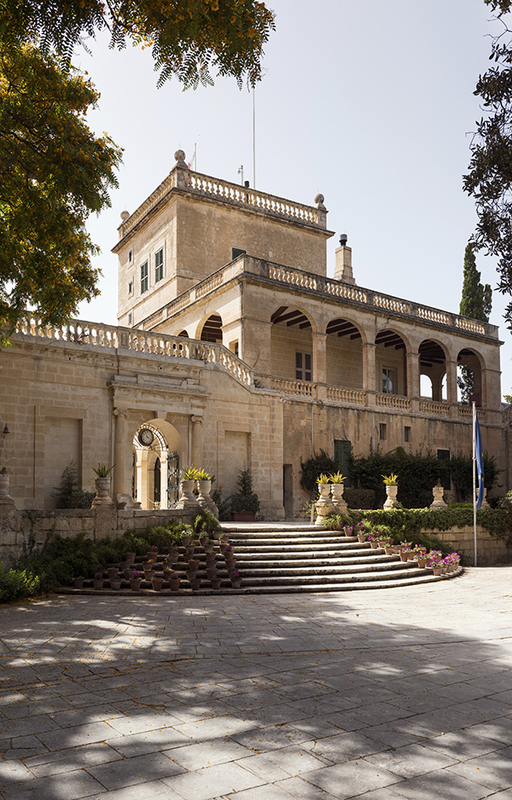 Owing both to his artistry as well as historical sensitivity, Korver was brought on board the San Anton redecoration project by Lisa Carson of Milano / Malta based design firm DAAA-haus and charged with the task of instilling a new sense of painted imperial magnificence in the palace’s Grand Salon. 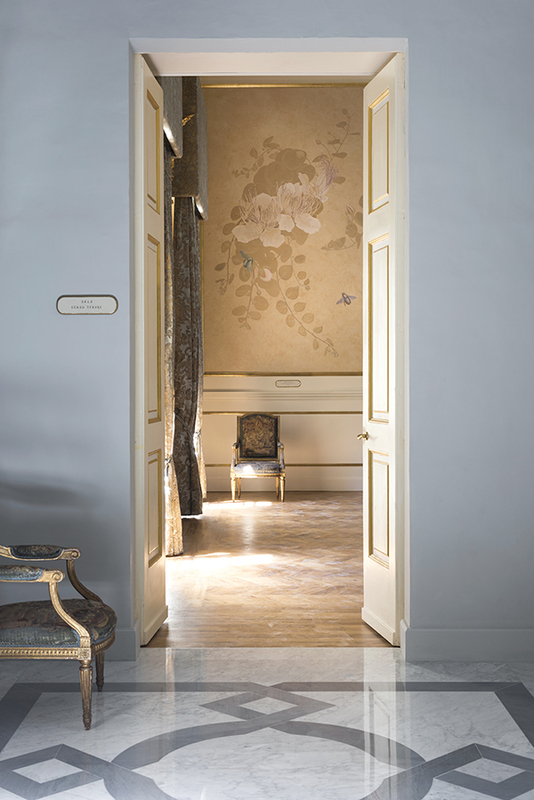 Three meter high paneled doors lead to the Salon. Renovations began with the music room in 2015, and over the course of the following years, six further state rooms were restored of which the Grand Salon is the largest With windows on both sides, the room seems to act as a link between the extensive gardens the Palace has been surrounded with ever since it was built in the early 17th century as a country retreat by French knight Antoine de Paule. Leaves of Malta's miniature Irisses, bringing to mind the complex curling ornaments of the Rococo. 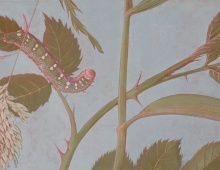 In much the same way an Agave wriggled its way into the palace’s paintings. 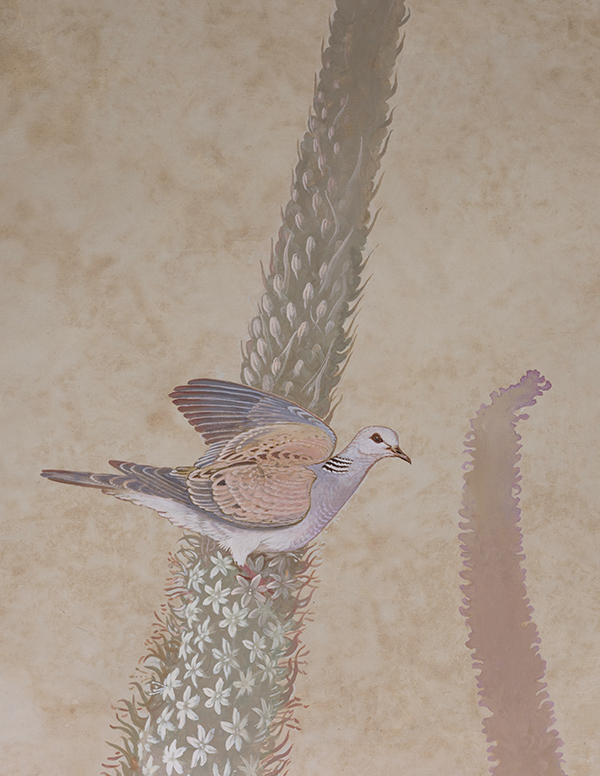 Yet, the original plan was not entirely overthrown and to counterbalance his choice for two invasive plants taking up permanent residency on either side of the Salons fire place, Korver paired them with animals symbolic to Malta in other ways; Turtledoves, a Peregrine falcon and even a pair of the countries endemic Wall-lizards. Turtledove ( Gamiema ) in a towering Agave flower. Maltese Swallowtail butterflies, suspended from the large intricate leaves of Giant Fennel. Indeed, upon entering the Grand Salon, one now finds Malta’s vegetal residents towering high over one’s head. 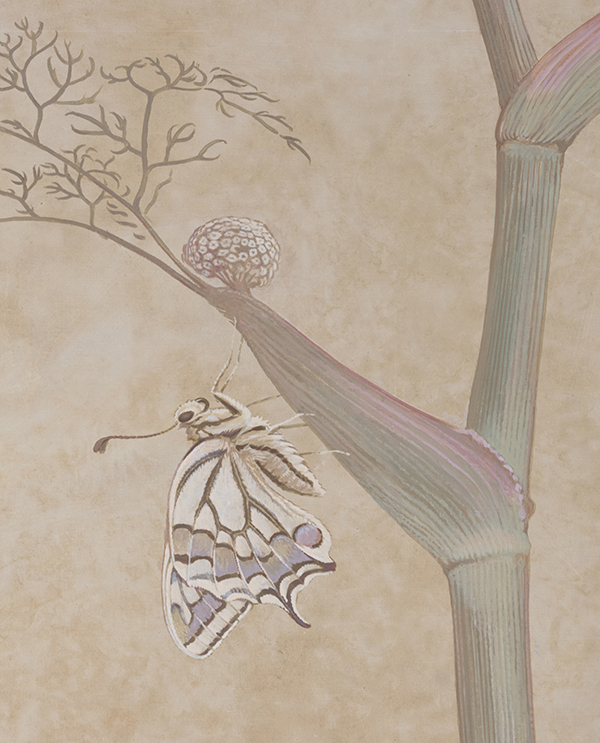 The Giant Fennel Korver encountered appears to have grown to even more majestic proportions, as have the dormant swallowtail butterflies suspended from its leaves. 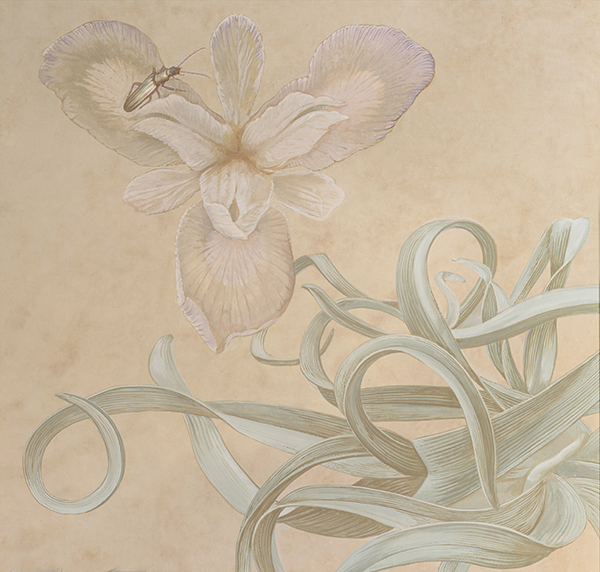 Meanwhile, the spiralling leaves of Malta’s miniature irises have been enlarged a hundredfold, now bringing to mind the complex curls of the Rococo. 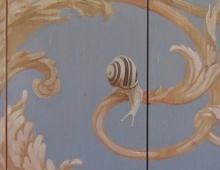 ‘I have come to consider them as ‘portraits of the other residents of Malta,’ Korver says, ‘or, if you will, due to their size, as ‘state portraits.’ As with most paintings in the island’s three national palaces, a wooden plate with gilded edges has been placed underneath each of the new panels. 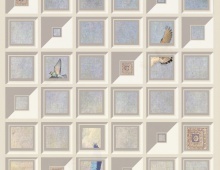 In this case however these plates don't read the names of historic heads of state like Alexander Ball, Queen Adelaide, or Grandmaster de Paule, but: Sea Squill, Turtledove or Carpenter Bee . 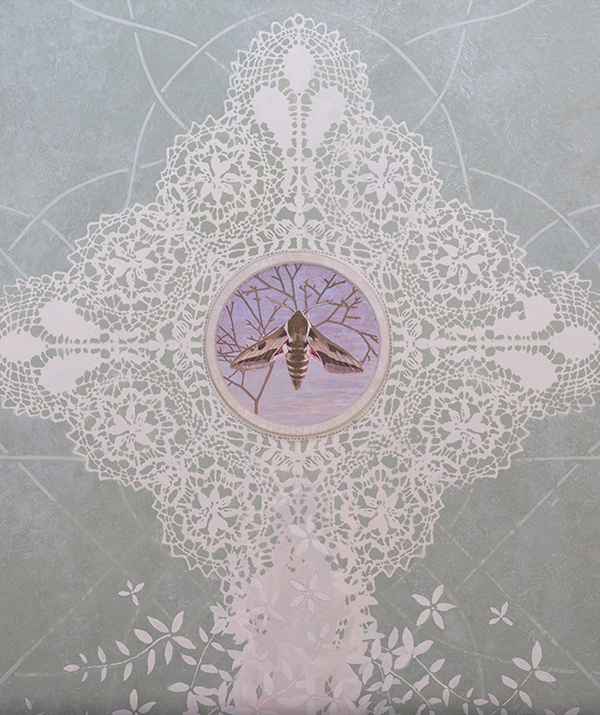 One of the four Maltese Lace cartouches on the ceiling, each with a different species of Hawkmoth. 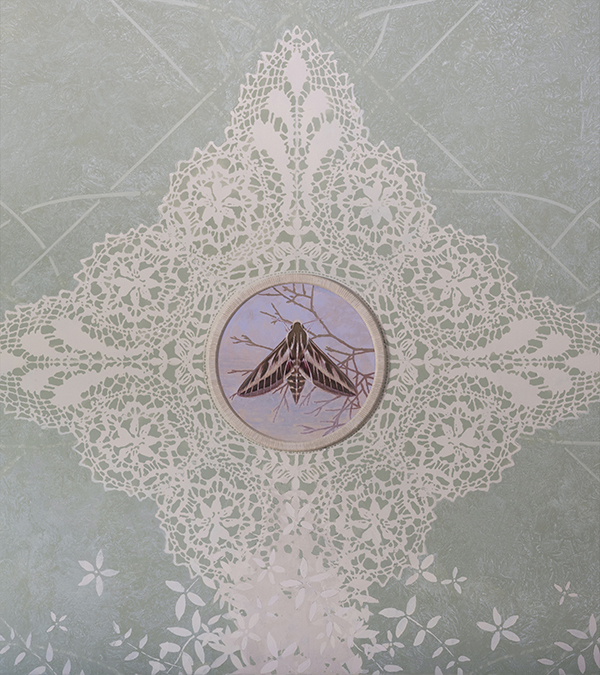 Maltese bobbin lace has been world-renowned for eons, but the squares and circles of its intricate handkerchiefs, collars, cloths and coasters also reminded Korver of “those magnificent 18th century Georgian ceilings”, so it was clear from day one that lace somehow would serve as the base of the design for the Salons domed ceiling. Malta’s lace however is by nature not as floral as Brussels’ or Venetian for instance, so to get it to match the botanical theme of the room a ground of basic lace stitches was superimposed as a meandering grid, stretching the ceiling from corner to corner like the latticework of the faux painted treillage gallery this palace wing is said to have once held. 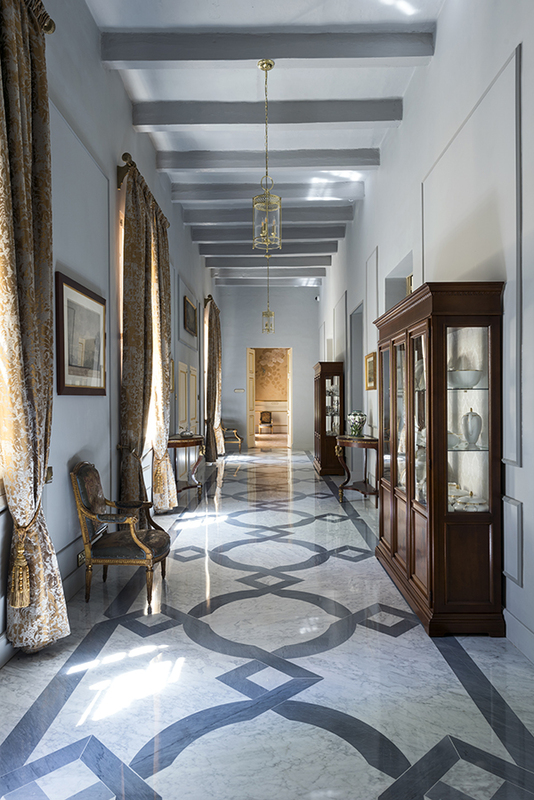 In the summer of 2018, the restored State Rooms at San Anton Palace were inaugurated and while all rooms now look, once again, as splendid as Coleridge could have found them, it is the Grand Salon that stands out. Not just for its size, but because, thanks to its connection with the gardens and the textile, almost tent-like appearance of its domed ceiling, the room has become a breathing space where fresh air appears to flow freely in and out. 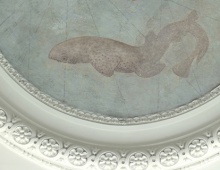 “All plants and animals depicted in the room are connected in one way or another,” Korver pointed out on the opening occasion. 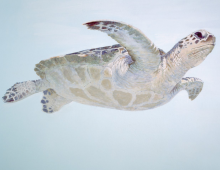 “Connected by ecological relations, as they live ‘on’, ‘from’, or ‘with’ each other. They are also connected by stories, by history, or simply, because they share the limited space of these islands together. With each other and with us. 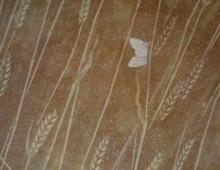 Together, we make up “the Lace of Malta” or, as the Maltese title of his work reflects; ‘Bizzilla ta' Malta’. 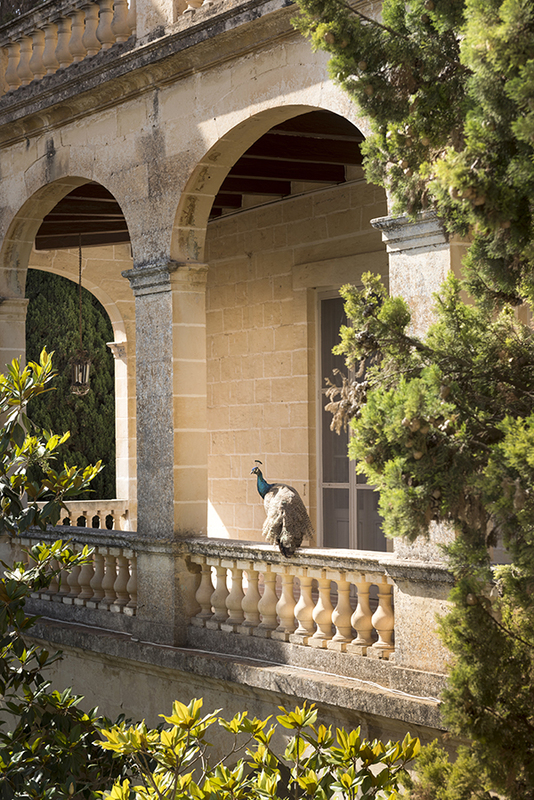 With their wings fully functional, the gardens peafowl often fly up to take an inquisitive stroll around the arched verandas, the terraces, walkways and belvedere that were all added to the exterior of the palace’s ‘piano nobile’ in the early 1800’s. Sometimes one of them cautiously steps inside, through an occasional open door. 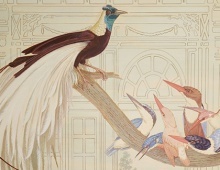 A world class private collection of French and American modernist design classics in an environment of painted animals by Dutch artist Peter Korver. 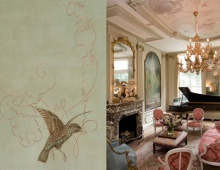 The entrance of this 1790’s palazzo was changed into a painted gallery of aviaries where birds hang around with historic memorabilia. 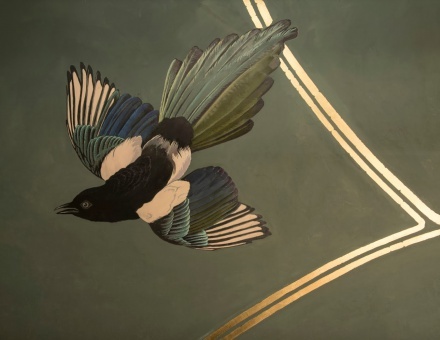 Gilded murals of Magpies and Peacocks for a new high-end club-scene hotspot , located in a historic Amsterdam Bank office. New painted panels and ceilings for a fully retsored 1870’s Arts and Crafts monument on the banks of small river outside of Amsterdam. 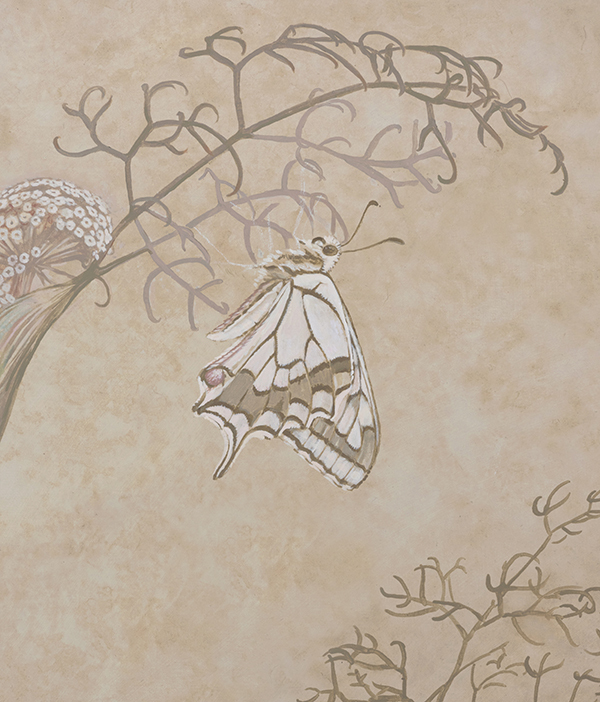 Painted dragonflies, butterflies and insectivorous birds on a new, large scale coffered ceiling for the boardroom of a Cees Dam designed corporate office.